The Fire Mages is the second book set in the Brightmoon world. It’s a stand-alone book, with a completely different location and a new set of characters; you don’t need to have read The Plains of Kallanash first. It is available to buy now. You can read the first five chapters here. If you’d like to be notified of news from the Brightmoon world and the release of the next book, sign up for the mailing list from the Buy! option above. You will only receive occasional emails. A determined girl. A cranky mage. An unwanted heir. A mysterious magical city. Kyra’s always been drawn to the magic of spellpages. She’s determined to leave her small village far behind and become a scribe, wielding the power of magic through her pen. But a simple favour for her sister goes disastrously awry, destroying Kyra’s dreams in an instant. What went wrong? Devastated, she accepts an offer to find out from a stranger, who sees growing power within Kyra, potentially stronger than spellpages or any living mage. While she struggles to understand her magic, she’s surrounded by the greed and ambition of the court, uncertain who to trust. The answers may lie within the glowing walls of the Imperial City, but its magic is strong and the unwary vanish without trace on its streets. Kyra will have to learn fast to survive. 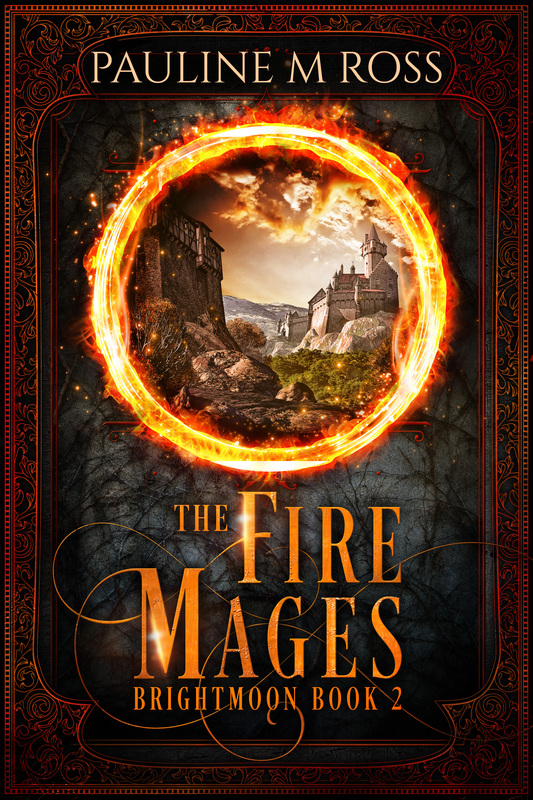 The Fire Mages is written by Pauline M Ross, with cover design by Deranged Doctor Designs and proofreading by Coinlea Services.